Life BWW Fellow Prof R Riemschneider continues herewith his report from 2006 on the alternatives to atomic energy and oil giving latest news and more details concerning alternative sources of energy. Only the geothermal energy meets the following three conditions: to be inexhaustible, to be an incessant energy supplier and to be without noxious emissions. During the last 10 years the solar techniques made excellent progresses, together with geothermal energy it will become one of the most important energy source of the future, environmentally friendly and infinite like the geothermal one. Studying the methane chemistry, Sir Davy received from “methane and H2O under pressure and at low temperatures a quasi compound” which today is acknowledged as methane hydrate. Of course, this “compound” which could not have been understood 200 years ago. And was not further regarded until to the discovery of the so-called methane ice better methane hydrate or methane clathrate. For better understanding of the term “clathrate” see illustration 1 (2). The brillant English chemist Sir Humphry Davy studied between 1810 and 1815 for the Society for Preventing Accidents in Coal Mines the conditions under which mixtures of free-damp and air explode, including especially methane and oxygen and air (methane is called in German language “Grubengas”, responsible for “Schlagende Wetter” in coal mines). This research led Sir Davy to the invention of the safety lamp [Davy´sche Sicherheitslampe: SPECIAL PART B] and to subsequent investigations on flame, for which he received the RUMFORD medal (gold and silver). Methane clathrate is a solid form of water that contains a large amount of methane within its cristal structure (a clathrate hydrate: illustration 2), occurring only in regions where temperatures are low and water ice is common. At higher pressures methane clathrates remain stable at temperatures up to 18° C.
Because of its molecular structure, methane hydrate is also called "crystal gas". In the meantime, the crystal structure of methane ice crystals of different origins has been examined by X-ray at -200 to -220°C in suitable sample containers: old natural methane ice crystals are much bigger in size than those prepared in a laboratory, perhaps a method suitable for determining the age of methane clathrates. In a lab, methane hydrate is formed at a temperature of 2 to 5°C and a pressure of 40 to 60 bar (3); in nature, it is formed at certain depths of the ocean under a layer of decaying material under such or other conditions. Extremely large deposits of methane clathrate have been found under sediments on the ocean floors of the earth, for instance near the coasts of India, China, Japan (see illustration 3). One might well speak of "concentrated energy" which is contained in methane hydrate as a result of methane being compressed at high pressure deep in the ocean (4a,b). In nature, methane hydrate was first found in the 1930s when gas pipelines became clogged. In the 1960s, it was located in regions of permanent frost in Siberia and North America. Starting in the 1980s, methane hydrate was then detected in many locations under the ocean floor, especially at the continental shelves several hundred metres below the surface. 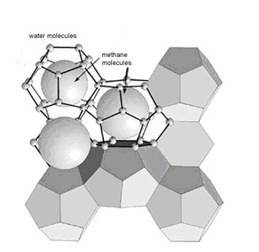 The average methane clathrate compostion is 1 mole methane for every 5,75 moles water (density around 0,9 g/qcm); though this is dependent on how many methane molecules “fit” into the various cage structures of water lattice; 1 L of methane clathrate solid as mentioned above would therefore contain, on average, 168 L of methane gas (at STP). In Asian countries like Japan, China and India methane clathrates are curringly beeing eagerly examined as a next general resource to replace oil and natural gas (and as the author hopes also to replace the atom energy): Illustration 3. The Research Consortium for Methane Hydrate Resources in Japan – also known as the MH 21 Research Consortium was established to undertake research in accordance with this project. 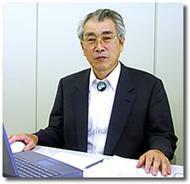 In Plate 1 you find a massage from the Project Leader, Dr. Shoichi Tanaka (5). Japan commissioned the research bore vessel Chikyu to locate and investigate methane hydrate layers: Ill 4. Energy is the driving force behind our daily lives and our social activities. For Japan, which relies on imports for most of its energy needs, securing a reliable supply of energy resources is a matter of great significance. The seas around Japan contain methane hydrate, which is currently the focus of much attention due to its potential as a future energy resource. The MH21 Research Consortium is currently engaged in research on the development of technologies that will enable us to extract methane gas, one of the most environmentally-friendly fuels known to humankind, safely and efficiently from methane hydrate layers beneath the seafloor. The MH21 Research Consortium was created through the joint cooperation of experts drawn from a number of fields. It is my sincere hope that your visit to this website will help you gain a deeper understanding of our work. By now China, India, South Korea and Taiwan are investing millions in the investigation of methane ice. 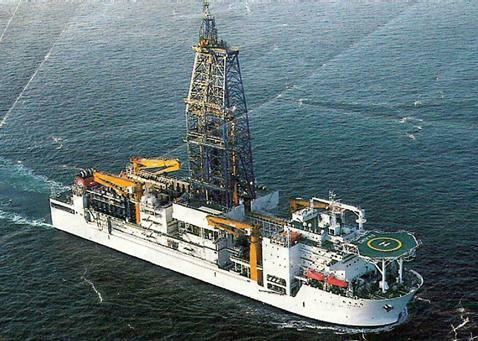 In mid 2007, the Chinese expedition leaders Shengxiong Yang and Nengyou Wu of the Guangzhou Marine Geological Survey Institute looked successfully for methane ice on the muddy bottom of the South China Sea and found it in layers of 20 m thickness, embedded in clay and sand. Allegedly, the porosity of this sediment mixture makes it suitable for recovery. Indian scientists found a 130 m layer of methane hydrate in the Krishna Godvari basin, one of the thickest ever found, as Malcom Lall, head of the Indian gas hydrate programme, emphasises. They were also successful near the Andamans - a "layer of frozen methane" lies dormant 600 m below the bottom of the sea, embedded in ash sediments from prehistoric volcano eruptions. Further details of the considerable activities of China and India can be found on the Internet. Recovering it from subterranean continental shelves may result in gigantic volumes of soil crashing into the sea, causing disastrous tsunamis, such as in December 2004 in the countries bordering the Indian Sea: 165,000 victims - but not in connection with methane ice. What we need now are methods of recovery suitable for every methane ice deposit. The necessary methane technology is still under development; in particular, the strong greenhouse effect of methane is a point of concern. According to the author's own experiments with methane clathrate prepared in a laboratory, pumping compressed CO2 into the bottom of the ocean probably has the best chance as a methane recovery method. At the same time, this laboratory method described by the author in 1999 [eq 1 and 2 in (3)] ensures destruction of the greenhouse gas CO2 - details in SPECIAL PART A. The author has noted with great interest that the project "Sugar" (investigation of submarine gas hydrate repositories) came into being in 2007 (4). A cooperation between geo-scientists from several institutes is intended. Meanwhile, the topic "methane ice" has also been picked by popular fiction (6a-d). The enormous methane hydrate occurrences inspire once more the methane chemistry, i.e. to resume experiments preparing methanol directly from methane [or from CO2] instead of the detour via syn-gas. - the complete combustion of methane to CO2 is promoted from a thermodynamic point. Research regarding reaction: CO2 + 3H2 → CH3OH + H2O is running and already subject of some publications and recent patent applications - more or less realistically: (7a-j). When talking about methane clathrate deposits located below the bottom of the sea as possible significant energy suppliers, one must always keep in mind which energies can be "harvested from the sea itself": Two thirds of the surface of the Earth are covered by the oceans. These are partially heated by the sun, influenced by the moon (tides), and are always in motion (wind, streams, tides). Energy can also be found in the salt content of the oceans (osmosis). 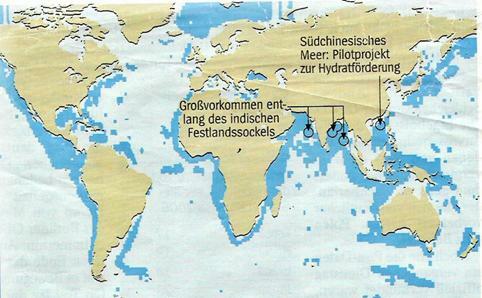 "Salt water thermal power stations" result from the heat of the oceans (8, 9). The flowing water from rivers driving turbines in hydroelectric power plants to generate electricity must also be kept in mind. Since the tides are influenced by the moon, there are more or less pronounced differences between low tide and high tide. Tidal power plants generate electricity via turbines (older ones via mill wheels). The largest tidal power plant at present is operating in China near Jiangxia, province of Zhejiang. Smaller plants of this kind are found in Eastern Canada, Fundy Bay, and in France near the estuary of the Rance near St. Malo. In the United States, a small plant is operating on the East River in New York, but it feeds only one supermarket. The largest tidal power plant ever planned is presently under construction in South Korea. A plant of this kind is also planned in Great Britain, namely a submarine tidal power plant with 4 to 8 turbines. Unfortunately, the profitability of larger plants of this kind is still controversial or not guaranteed at present. However, it is necessary to gain experience so as to be able to utilise the tide and waves. Perhaps the Seaflow project in Northern Devon on the British Atlantic coast with a tidal flow of 3 metres per second at a depth of about 20 metres can be considered a success. It operates with a two blade rotor of a diameter of 11 metres at 15 revolutions per minute. The tidal flow drives the rotor blades which may be adjusted to allow using the flow both at low and high tide. This plant was constructed in 2003. At present, the follow-up project Seagen is under way to test a flow-driven generator with a twin rotor. The ancient idea of George Darwin, son of the founder of the evolution theory, to use the flow of water to generate energy, must also be mentioned under the heading flow-operated power plants. He proposed to collect water in basins at high tide and to drain it via mill wheel or turbines at low tide. At present, a similar project is under way in the Gulf of California under the direction of the National University of Mexico. Basic principle: Water gains height energy because waves run up a ramp and then flow into a basin, driving a turbine on their way down. This is a small-scale plant, for example 2,000 to 3,000 households, which is presently being tested along the Welsh coast in Great Britain with EU funds. Such buoys make use of the continuous up and down of waves: the central unit is a buoy anchored at the bottom of the sea. However, an air chamber on top is linked to this buoy via a mobile cylinder. Thanks to its buoyancy, this air chamber floats up and down with the waves. The air subjected to cyclical compression drives a turbine generating electricity; tested in Galway Bay on the West coast of Ireland in 2006. This plant consists of steel tubes with articulated elements which are able of moving both horizontally and vertically against each other. A substantial feature are hydraulic arms in the joints. Every wave passing this construction rotates the tubes against each other, resulting in a liquid being pressed into a cylinder at the hydraulic arm. This, in turn, drives a turbine. A prototype of such plants is found on the coast of Scotland; another one is under preparation in Portugal nr. Porto. This works according to the principle of the oscillating water column. The power plant has a chamber connected with the sea through a shaft with water at the bottom and air on top. The waves coming in at the bottom cause the water level to rise and compress the air, which escapes through a tube and drives a turbine both leaving and returning. A prototype is the Limpet power plant in Scotland on the isle of Islay. Such plants use the difference in the salt concentration between salt water and fresh water: When salt water and fresh water are separated by a membrane which allows permeation of water, but not salt, water molecules migrate from the fresh water into the salt water basin (in an attempt to compensate for the difference in concentra­tion). More water is now present in the salt water basin resulting in a pressure capable of driving a turbine. Both the river water and the sea water used must pass through filters for purification. The actual operating module, the membrane of the plant, has been rolled into tubes to save space. The end of the plant is the turbine house where turbines are operated with pressure supplied by sea water to generate electricity. A first plant of this type has been in operation in Hurum in the Norwegian Oslo fjord since 2007. Tube weir membranes (elastomer elements reinforced by fabric) in the hollow bodies of the hydroelectric plant dams flowing river water to a suitable height to obtain a high velocity for driving the turbines. The level of the damming is adjusted by regulating the air and water pressure in the hollow bodies. This technology of using absolutely water- respectively air-tight membranes has reached maturity by now. Many such plants are in use, the largest has tube weirs of 7 to 8 m in height and 150 m in width. Water on the surface of the sea has a higher temperature than water in deeper layers. This thermal gradient could be put to good use by power plants using sea water. In 1881, Jacques-Arsène d’Arsonval supplied the theoretical foundation for this type of energy conversion, i.e. generation of electricity by a turbine connected via a generator. So far, power plants using sea water have not been put to use except at a household scale, probably because the cost and size of the technical equipment required are in no relation to the energy output (8, 9). Alternative sources of energy as well as consistent energy saving and rational CO2 management have become the focus of attention only over the last ten years. This change was primarily accelerated by the fear of possible climate changes. It has also spurred on the search for and use of alternative energies, especially geothermal and solar energy. We all know that "the earth is its own biggest power plant". This was written by the author over 50 years ago when people first began propagating and using nuclear energy (12p). Even in his essays dating back to 1947 and 1949, the author emphasised that "power plants using geothermal energy are capable of supplying energy continuously and always, do not emit contaminants and would not have to rely on sunshine and wind like solar power plants or wind turbines which do not supply energy when the sun does not shine or the wind does not blow [“Wind energy”: The author tackled the pros and cons about this subject in the essay (12p), already long time ago]. - Once developed, however, geothermal energy would be supplied day and night - an advantage vis-à-vis solar energy". In the essay quoted above, it was already stated that the future of geothermal energy will depend to a large extent on the development of drilling technology. However, it was also noted: "Perhaps geothermal energy appears insignificant to many: The world under our feet remains unnoticed and cannot be felt like sun and wind." Quotations from "The earth's largest power plant is earth itself" („Das grösste Kraftwerk der Erde ist die Erde selbst“) (12p). Thanks to its geographic location, Iceland is a role model for using geothermal energy. Scientists are working with great intensity to recover supercritically fluid water (SCW) as a possible energy source by borings at a depth of 5 km - water at a temperature of 500°C and under high pressure. The subterranean magma chambers of the volcanic island heat the water to 500°C; the pressure deep down is 220 bar. This water exceeds its critical point and is thus neither gaseous nor liquid, but very rich in energy. In this state, the water is much richer in energy than the steam intensively used by the Icelanders even now to recover electricity. Using geothermal energy to obtain heat and electricity covers both "geothermal energy close to the surface" for direct use (heat pump heating) and also "deep geothermal energy" for direct use on the heating market or indirect use for generating electricity. In order to recover geothermal heat, deep geothermal energy works with a closed system and boring to a depth of 2,000 to 4,000 metres. In the worldwide generation of electricity from geothermal energy, those geothermal deposits providing a very high temperature are ranking on top. These are heat anomalies accompanying volcanic activity. This is also where fluids having a temperature of several hundred degrees (water/vapour) are found at a comparatively small depth (correlation with volcanoes). Of particular interest is the generation of electricity from hot steam. For this purpose, the water heated underground is used to drive a turbine. This closed circuit in the circulation system is under such pressure that boiling of the water pressed in is prevented and steam is generated only at the turbine (flush method). According to a report from "Scientific American" the U.S. Government and Google (the latter with 10 million dollars) are funding intensive research on the development of geothermal heat by refining the "Hot Dry Rock" process to the “Enhanced Geothermal System” (EGS); see SPECIAL PART D.
Regarding the use of geothermal energy, scientists have now calculated that the worldwide energy requirements could be satisfied for over 100,000 years with the energy supplies stored in the upper 3 km of the earth's crust (10a). Only when the drilling technology developed by the American Potter approximately 30 years ago has matured and is ready for use will we be able to penetrate deeper into the crust of the earth, i.e. recover geothermal energy from many more sites of the earth's crust. The author is thinking of the "non-classic HT drilling technique" that does not need to rely on bore heads: POTTER DRILLING uses a process known as "hydrothermal spallation" which has "the potential to lower the cost and expand the range of deep hard rock drilling". This technology works with a metal die instead of a bore head, i.e. with a "flame jet drill" operating with a H2 flame at a temperature of more than 1800°C without wearing out the drill. This H2 flame drills through granite at approx. 50 cm per minute. The granite is overheated so that fissures occur. The POTTER DRILLING company expects that drills at a depth of up to 15,000 metres will be possible with the HT system so that geothermal energy can be tapped everywhere one day; cf. also Plate 4 in SPECIAL PART D.
In France, namely in Soultz-sous-Forets in the French part of the Upper Rhine valley (Alsace), a team of French, German, British, Italian, Swedish and Swiss scientists is working for a European HDR research project (11) described in detail in SPECIAL PART D.
A similar geothermal boring was started near Basle in Switzerland in 2006, but had to be discontinued because it triggered seismic movements: 3,4 strenght on Richter scale. With the objective of utilising geothermal heat, American physicians inadvertently drilled into a magma compartment at the edge of the Kilauea volcano on the main island of Hawaii in 2008. Luckily, this penetration into the liquid magma at a temperature of 1000°C did not result in disaster - the molten rock did not reach the surface, but became stuck just a few metres below. There is one geothermal power plant generating both heating and electricity in the author's home country, Germany, namely in Neustadt-Grewe, in the federal land of Brandenburg. Small-scale geothermal plants are more common; the most important ones are located in Waren (Vorpommern), Erding (Bavaria) and Neubrandenburg (Mecklenburg-Vorpommern). However, all of these have only a small capacity. It is intended to start operating plants in the following locations in the near future: in Offenbach (Rhineland-Palatine) and Unterhaching (Bavaria) which can supply heat and electricity to approx. 20,000 households. A geothermal power plant is under construction in Finowfurt in Brandenburg which is allegedly going to supply 25 megawatts of electricity recovered from a depth of 5,000 m from 2009 onwards. Conclusion: Only the geothermal energy meets the following three conditions: to be inexhaustible, to be an incessant energy supplier and to be without noxious emissions. If politicians had reacted immediately after the 1973 energy crisis, i.e. if they had decreed the use of the environmentally acceptable solar energy in the form of photovoltaics (generation of electricity) or solarthermy (generation of heat) or both by law at least for all new buildings, millions of houses would be equipped with solar technology today; any plants installed before 1993/98 would already have paid themselves off, especially if the government(s) had offered an adequate rate for kilowatts fed into the system. Today, it is even possible to use all of the solar power at once: a combination of photovoltaics (use of the visible light of the solar spectrum) with solarthermy (use of the infrared portion of the solar spectrum) in one cell. This saves space in comparison with the two elements that had to be installed previously if electricity and heat are to be obtained simultaneously by solar technology. Since the performance of the photovoltaic elements deteriorates when the temperature rises, the voltaic element is cooled to 60°C in case of the hybrid cell technology. Another step forward in the field of solar technology is to supplement the combined system outlined above by a thermogenerator to use excess energy: a hybrid system with three collectors (also utilising the so-called Seebeck effect). Use of solar energy and hydrogen is making progress in some countries – think, for example, of hydroelectric power and the large solar power plants due be connected to the grid in Portugal and in particular California, USA. California is leading in solar energy. The German NOVO SOLAR is cooperating with Californian solar industry and has developed a new solar cell type – in practical trial in California which is supposed to be cheaper than earlier ones. Above all there is not a single NPP of the second or third generation - also due to the danger of earthquakes. What is probably one of the world's largest solar power plant, a parabolic channel power plant, is presently under construction in Spain (10b): Andrasol in La Calahorra in Andalusia. This plant operates with 366 parabolic-shaped curved mirrors of approx. 12 m in length and 5 m in width. A thermo-oil heated to almost 400°C circulates in a tube system. Water is heated to steam by a heat exchanger in a second circuit. Via a steam turbine, this steam drives a generator which supplies electricity. Excess heat not used for electricity immediately is "stored temporarily" in salt deposits (two tanks containing two potassium sodium nitrate melts of 28,000 tons each). This stored heat can be called up and fed into a steam turbine. We saw that the solar techniques made excellent progress; together with geothermal energy it will become one of the most important energy sources of the future, environmentally friendly and infinite like the geothermal one. Solar energy and hydrogen technology are closely related. (SiH2)x is an interesting H2-carrier, investigated by the author in the frame of his silane research (12e,f). (SiH2)x can serve also as H2-storage substances for stationary applications, e.g. for low-cost H2 generation in hydrogen filling stations, avoiding a costly infrastructure. (SiH2)x (I) has advantages vis-à-vis H2 compressed to 700 bar (II) or liquid H2 (III) regarding volume requirements, if H2 storage is an issue. For example, a 1 kg comparison of the volumes of II : III : I gives 25 : (15 – 20) : (5 – 7). Hydrogen in the form of polysilanes can be transported without any problems and stored wherever hydrogen generated as needed is to be converted to electrical energy by conventional combustion or by combination with fuel cells: (SiH2)n hydrolyzed to SiO2 and H2. Neither the oil crisis of 1973 nor the disaster at Chernobyl in 1986 nor the many problems caused by the operation of nuclear reactors of the second and third generation [where to dispose the waste (13) ?] have convinced politicians and industrialists to change their attitude. Dismantling of abandoned nuclear power plants is difficult and costly and will remain so for many years to come. On August 12, 2000, the world narrowly escaped a second Chernobyl when the Russian nuclear submarine, Kursk K 141, sank - the submarine commander switched off the two nuclear reactors on board just in time. The politicians and industrialists should stop the use of the NPPs of the second and third generation and not extend the operating time of existing ones beyond the intended shut-down date. Since a number of years the fourth NPP generation like type PBMR (Pebble Bed Modular Reactor) which guarantee more safety exist. Quotation of H J Werhahn, expert of energy problems: "The pebble bed type technology is inherently far safer than any conventional reactor technology, even if the latter is further improved by retrofitting. Right from the beginning, the pebble bed type technology was intended for areas of concentrated habitation. This was possible only because this technology is inherently safe. A pebble bed type reactor cannot blow for natural reasons" (14a). In the PBM technology, reinforced grains having the size of a grain of sand are used instead of fuel rods. These are nuclear fuels of the size of a needle point surrounded by a sheath of silicon carbide having the hardness of a diamond. Then they are encased in a palm-sized graphite ball. All this warrants practically unlimited stability. The nuclear fuel is continuously fed into and withdrawn from the reactor in the form of balls without the reactor having to be switched on. This also solves the tiresome problem of ultimate disposal - not to mention that we would be safe against terrorist attacks. Uranium is a radioactive metal. About 99.3 % of natural uranium consist of the isotope 238U and 0,7 % of 235U. The special significance of uranium was recognised only after the discovery of nuclear fission in 1938: Like a few other nuclides with an uneven number of neutrons, the uranium isotope 235U is fissionable comparatively easily by thermal neutrons; however, it is the only known natural substance capable of a nuclear fission chain reaction. Therefore, it is used as a primary energy source in nuclear power plants and nuclear weapons and has gained considerable financial significance. The range of impact in case of nuclear fission induced by a thermal neutron is large for 235U and 233U, but minimal for 238U. In a technical-practical sense, therefore, only the isotopes 233 and 235 are easily fissionable and therefore constitute potential fuels for nuclear reactors. The critical mass of 235U is 49 kg (12g). In thorium high-temperature reactors such as the THTR-300, thorium us used to prepare the uranium isotope 233U: By neutron irradiation, 233 Th is bred from thorium 232Th; this disintegrates via protactinium 233Pa to obtain uranium 233U. Since thorium is far more common than uranium, this process may be an important source of energy in future after the expected depletion of the world's uranium supply. This is even more true since thorium high-temperature reactors on PBM basis have been developed. In the meantime, China is operating several high-temperature nuclear reactors on PBMR basis [which started with a cooperation with German scientists from Jülich and Stuttgart]. 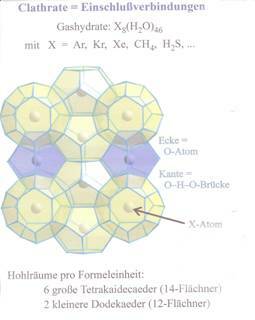 The pebble bed type reactor technology described above was developed in Germany under the direction of Prof. Dr. Rudolf Schulten at the Jülich Research Centre. In 1986, Prime Minister Rau of North Rhine-Westphalia decreed that the completed reactor should not become operative in Germany. In the author’s opinion this was a misjudgement: The promising high-temperature reactor on PBM basis was sacrificed on the altar of the "green" party's ideology 20 years ago. In the meantime, China and South Africa have become leaders in the field of this new revolutionary reactor technology (14b). The United States markets mini nuclear power plant modules developed in the laboratory of the U.S. Government in Los Alamos: HPM (HPG = Hyperion Power Generation) (15). When taking a close look at all alternative energy sources, only geothermal energy and solar energy appear infinite. The latter can be used more "easily". Observations to date indicate that especially geothermal energy and solar energy have potential for the future. The recovery of energy based on coal should be restricted owing to the high CO2 emission. CO2 can be disposed in great depths or processed with beneficial effects. We should exercise restraint regarding the construction of new coal power plants; coal should be reserved for chemical purposes: Tables 1 to 6 in the APPENDIX. This report should not end without mentioning the greenhouse gases at least briefly. CO2 gas damaging the climate is not just produced by the industry. 6.7 billions of people plus the vast number of animals, especially domestic animals, like cattle, produce enormous amounts of CO2 and CH4 if we just think of ruminants. Added to this are the amounts of CO2 from the industry and the combustion of fuel. CO2 compensation by oceans and assimilation is insufficient. The quantities of CH4 produced by ruminants are much higher than we think. Unfortunately, there is little we can do about it. In addition, CH4 known as a greenhouse gas and considered even more dangerous reaches the atmosphere not only as a metabolic side product of ruminants, but also from the bottom of the oceans. All that can presently be done regarding ruminants producing CH4 is to cut down on the production of meat in countries like Brazil, Argentina (cattle), Uruguay, Australia (sheep), i.e. to reduce the number of animals. In addition, enormous amounts of food are withheld from humans as a result of breeding stock for the production of meat. The author has been working on the issue "reduction of CH4 formation" since 1965. Originally, his objective was not protection of the climate, but improvement of the nutrient uptake of ruminants; also see the comments in SPECIAL PART C.
As far as CO2 is concerned, the only way out is to promote and put to use alternative energies worldwide as soon as possible. Since 1949, the author has been investigating compressed CO2 as a solvent and as a reaction medium, for example in studies of the "Behaviour of the C6HcCl6 isomers vis-à-vis amino acids in fluid CO2" (12a,b). At the end of the 1990s, the author studied the reaction of compressed CO2 with several gas clathrates in lab experiments (3) carried out in collaboration with Drs. F.R. Pesserl, M.M. Faria and D. Kirstein: eq 1. 1 : 1, but >3 : 1. At the same time, this reaction eliminates the unpopular anti-climate gas CO2 - killing two birds with one stone. The main objective of his own lab experiments with methane ice formed first was to identify the best pressure and temperature conditions for the release of CH4 , both in the presence and in the absence of NaCl (3). Our experience with "reactions in compressed CO2" gained from 1949 until the 1990s turned out to be very useful for the methane ice experiments mentioned above. At the time, fluid CO2 was tested as a non-polar solvent, especially in cases where organic solvents failed or were not sufficient (12a-c). We have also found that enzyme reactions may be carried out in liquid CO2 as a non-polar solvent instead of water. Surprisingly, the protein molecules with their complex structure withstand high pressures (according to our tests, up to > 500 bar) and temperatures high above 37°C. Owing to these characteristics, it should be possible to develop new areas of application for industrial catalysis with enzymes (taken from the manuscript of the lecture held at Farbwerke HOECHST in a colloquium in 1952). Catalysed reactions of syn-gas (CO + H2) in liquid CO2 are starting points of interest (12h). In the mentioned colloquium at Farbwerke HOECHST, the author first spoke about such experiments and also wrote a memorandum about them. Details about the contents of the lecture are published in the essay "Bonded to People", see SPECIAL PART F (12c). In the industrial exploitation of the reaction according to eq. 2, an injection of liquid CO2 into the bottom of the ocean containing methane ice would release CH4 as a result of the decomposition of the clathrate, while CO2 ice formed would remain on the ocean floor. In view of the enormous quantities of methane ice located under the bottom of the sea, this would be a fantastic process to dispose of CO2. It is worth mentioning that the method of CO2 injection has been in use in the mineral oil industry for many years, for example by STATOIL-HYDRO, to improve the recovery of oil. If the air in the mine contains more than 1 % of methane, a bluish hood appears over the petrol flame, warning the miners in time and giving them a chance to take action. No explosion of the gas in the mine (firedamps are usually a methane gas explosion) can be caused by the petrol flame, because the wire netting disseminates the heat of the flame so fast that the ignition temperature of the methane-air mixtures is not reached. In order to prevent an explosion caused by the lighting of the lamp, an attrition ignition device is mounted inside the lamp: When a screw at the bottom of the lamp is turned, a spark from a cerium steel lighter flies to the petrol-saturated wick inside the wire netting. When we speak about methane, the significance and occurrence of this hydrocarbon in the universe must certainly be mentioned. For example, methane has formed the world of the moon Titan, the largest of the 94 Saturn moons discovered so far. When the space probe "Huygens" landed on the surface of Titan on January 14, 2005 the photographs showed that something like a "plop" must have occurred. "A gas bubble which had probably been formed by the evaporation of liquid methane heated by the probe escaped from below. What water is on earth, methane is on Titan. As opposed to Earth, the rivers on cold, exotic Titan do not run with water, but methane. The photographs transmitted by the landed probe 'Cassini' show river beds in branched valleys and mountains as well as plains 'covered in mud' formed by liquid methane. The photographs of the landing site of the probe show objects looking like 'pebbles' and 'lumps of ice', shaped round by flowing methane" (17). Since microorganisms in the organism of ruminants are responsible for the formation of CH4 (12m), it should be possible to prevent this by adding certain substances to the fodder which inhibit such microorganisms. Decreased formation of CH4 would improve meat production: The less CH4 gas is expelled, the less carbon would be lost. Instead, carbon would be utilised in the organism. The better nourished such animals are, the more meat could be obtained. Such considerations were shared by the author and Dr. R.F. Pesserl in Brazil in the nineteen sixties; first tests in this direction were conducted at the fazenda of the rector of USFM in Santa Maria in the nineteen seventies and eighties (12L) after experiments with pertinent microorganisms had been carried out in Brazil and Berlin. There were more than 15.000 pieces of cattle on the fazendas of Dr. J. Mariano da Rocha Filho, and his wife Donna Maria, who also worked at UFSM. Initially there was not much interest in the issue of increasing the nutrient uptake in feeding, because the animals roam freely. However, there were a few stables where experiments could be conducted. We constructed a chamber which permitted quantitative determination of the gases - especially CH4 - emitted by a cow. We called this installation "gas exchange chamber” (Gasstoffwechselkammer). In their report. Dr. Pesserl and Dr. Mariano described both the chamber and the method and planned to publish their findings when the time was right. The findings we obtained as a result of using Y 2000 and other plant extracts are summarised in a publication (19). Main result: By inhibiting methanogenesis of cattle, 12 to 15 % less CH4 gas is emitted. The best results were obtained when we used Y 2000 which is probably due to the characteristics of Y 2000 which promote cell metabolism (20). Methanogenesis: Plate 6 in APPENDIX. The hot rock deep down is accessed through bore holes. Between the bore holes, flow ducts are created by water pressure (hydraulics; "frac") or existing ducts expanded. This creates a kind of subterranean heat exchanger where water pressed in from the surface may be heated to drive a turbine when it has been conveyed back to the surface. The circulation in HDR systems is of the closed-circuit type. This circuit is under such pressure that boiling of the heat-carrying liquid is prevented. Therefore, steam is created only at the turbine. A HDR power plant to be operated profitably by today's standards must guarantee an output between 25 and 100 MWth over a period of 20 years. This requires a heat exchanger surface of 3 to 10 km² which must be traversed at a bore hole spacing of approx. 500 m and flow rates between 50 and 100 litres per second. At a depth of 3,000 to 7,000 m under the territory of the Federal Republic of Germany, a geothermal energy of approx. 90,000 EJ is available. Without taking into account renewal of heat production from below, this should be sufficient to cover the country's energy requirements completely for 10,000 years. At an installed output of approx. 20 to 50 MW, HDR power plants are comparatively small, clean and harmless to the environment. Like all geothermal plants, they take up little space; the most important portion is below the ground. Soultz was selected as the site of this project, because it is right in the middle of the largest heat anomaly in Central Europe. This permitted working at a comparatively small depth of approx. 3,000 to 4,000 m.
At present, there are two deep bore holes in the experimental field of Soultz. Four additional "listening bore holes" permit observations of underground water movements. The distance between the two research bore holes is 450 m. Successful hydraulic injection and production experiments were carried out in 1993/94. Frac followed in 1994/95 with the result that two extensive tear systems (ausgedehnte Rißsysteme) were created in both deep bore holes. Two-week circulation tests carried out in 1996 showed that the system is serviceable as such. At an exit temperature of 140°C and a production rate of 20 l/s, a thermal output of 8 MW was achieved. Recent frac experiments made a circulation rate of over 20 l/s possible. A four-month test at this flow rate in early July 1997 also yielded extremely positive results. The result of additional experiments in Soultz-sous-Forêts should have considerable influence on the further progress of developing geothermal energy. As recently reported by nTV21 (January 2009), considerable difficulties have unfortunately occurred at the third drill hole in a depth of approx. 4,400 m in the meantime. 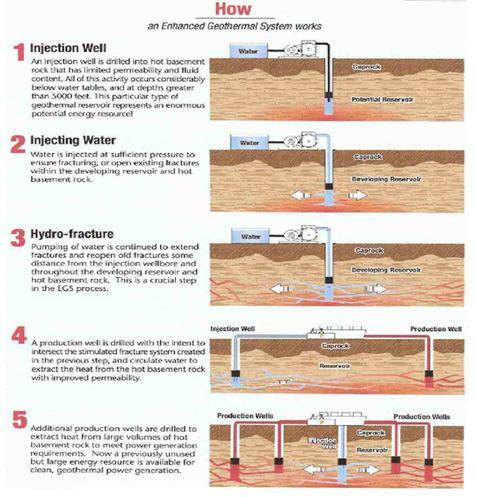 In Plate 3 you see how an Enhanced Geothermal System works (21). According to an Internet report (22) we know that ”POTTER DRILLING received 4 million dollar to develop ‘innovative drilling technology to enable clean energy solutions, including EGS. POTTER DRILLING uses a process known as ‘hydrothermal spallation’, which has the potential to expand the range of deep hard rock drilling. 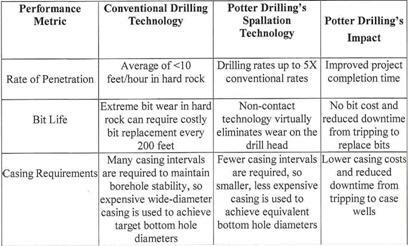 The POTTER DRILLING’s spallation-based technology is an entirely new approach to hard-rock drilling and has significant cost savings and performance advantages over conventonal drilling technology shown in the following Plate 4”. Plate 4: Comparative performance for hard-rock drilling (22). Details concerning „Flame jet drill“ etc. in Section III under geothermal energy. During the years 1943 and 1947, the author originally worked on the topic "direct selective catalytic oxidation of methane to methanol", namely in discussions with his friend and colleague at RUHRÖL, Dr. Heinz Hajek, in 1943, and during the preparation of his lecture "Hydrocarbons" in 1947. This 20 hour lecture on "Hydrocarbons" held at the Humboldt-University Berlin(EAST) in 1947, and later under the same title at the Free University Berlin(WEST) and in Brazil was based on the personal experience of the author at the hydrogenation plant of RUHRÖL GmbH during the Second World War in 1943/44 (12i). In connection with the formulation of this lecture series, the programme points A to F belonging to PROJ. III (12d) were also developed. At the time, Tables 1 to 6 and Plates 5 and 6 served as slides in the lecture "Hydrocarbons", held from 1948 onwards at HU, FU, and UFSM. As early as the 1920s and 1930s, there had been considerable efforts in Germany to develop synthetic fuels on the basis of hydrocarbons and alcohols. Let us just think of the processes according to BERGIUS and FISCHER-TROPSCH. During the Second World War, seven hydrogenation plants supplied considerable quantities of hydrocarbon based fuel (until the end of July 1944). In the 1980s, methanol was available from more than 100 gas stations in California. And in Brazil, for example, PETROBAS has been producing large amounts of ethanol derived from sugar cane (see Plate 4 behind Table 6) since the 1970s so that car owners have the choice between ethanol and petrol. Later on, this was taken over by UNICA (Sao Paulo Sugarcane Agroindustry Union). According to the FISCHER-TROPSCH process (16) starting with the syn-gas CO + H2 (Tab 1), different products could be obtained depending on the catalyst used: hydrocarbons or methanol: Pl 5. However, the profitability of this process left a lot to be desired, because the route led from coal to CO by oxidation and then back to hydrocarbon or methanol by reduction. Objections because of the unprofitability can be raised also against the RUHRÖl process in which hydrocarbon fuels, rich in aromatics, were recovered by high pressure hydrogenation of pitch and tar oils (12i). The author informed American specialists of the uneconomicalness of these processes when they had come to see him in Berlin in 1973 during the oil crisis because they knew of his earlier work in a hydrogenation plant. In addition, the technology used at the time must be regarded as outdated now. In times of war, however, profitability was not a priority consideration. The above-mentioned direct recovery of methanol from methane CH4 + ½O2 → CH3OH (Tab 5) discussed and experimented with Dr. Hajek (in the fourties) appears more profitable than the recovery of methanol from a syn-gas. However, there are thermodynamic reasons against such a process: the products methanol and formaldehyde obtained as a result of methane oxidation are too reactive, and the complete combustion of methane to CO2 is promoted from a thermodynamic point. Despite this unfavourable starting situation, the author carried out experiments of selective direct oxidation of methane to obtain methanol over the years; in particular, he worked in a customised, glass-lined autoclave at 250 to 400°C and 30 to 60 at. In a few cases, methanol yields of up to 5 % were obtained, depending on catalysts. Tables 1-6 and Plates 5 and 6. As far as the water gas reaction outlined in Table 1 is concerned, the author was able to gain experience of his own at the RUHRÖL hydrogenation plant (1943). Part of the hydrogen required every hour in an amount of 40,000 m³ for the high-pressure hydrogenation of pitch and tar oil distillates [700 at, 500°C, MoS2-catalyst (insensitive to sulfur)] was derived from syn-gas from water gas reactors [recovered by separating H2S (alkazid solution), CO (Cu solution) and CO2 (washed under pressure, PELTON gas)]. The remaining portion of the above mentioned amount of hydrogen was recovered from so-called coke-oven gas, delivered by a coke plant, in LINDE equipment: All of the components contained in the coke-oven gas were frozen out with the exception of hydrogen. For details, please refer to (12i). reaction 3 and 4 to avoid or suppress working with steam excess and short residence times in the reactor. Model experiments according to Table 2 were carried out at UFSM in Brazil in connection with a laboratory course for students. By working with an excess of vapour and correctly adjusting short-term blow periods, it was possible to prefer the reactions according to Equation 1 and 2. The reactions shown in Table 1 and 2 yield water gas (syn-gas) from which methanol may be recovered: Table 3. In case of methane as a starting substance, however, this is first oxidised to obtain carbon dioxide and then reduced to yield methanol. Reference: J A Christiansen, US Patent 1 302 011 (1919); M Marchionna, M Lami, Chemtech. 1997, p 28 ; R.Riemschneider, lecture „Hydrocarbons“ 1948.
eq 2: interesting to recover methanol from CO2 – see (7a-j) and point 6) (at the end of essay). The main problem of direct oxidation from methane to methanol is the high reactivity of the oxidation products (methanol, formaldehyde) themselves, i.e. the complete combustion of methane to CO2 which is favoured from a thermodynamic point of view. In a customised glass-lined autoclave, we obtained a methanol yield of 5 % at 50 at and 350°C. Improvement of the catalysts wanted. 2 I → H2O + H3COCH3 (V); V → - H2O → H2C=CH2 / H2C=CH-CH3. Reactions according to eq 1 depending on the catalysts like Fe-, Mg-, Th-, or Co-oxyd, gained under normal or low pressure at 160-200° C: Alcanes mixture as an example: about 15% propan/butan, 50% petrol, 28% kerosene (Dieselöl), paraffines 6% soft - 2% hard. The technology of the Fischer-Tropsch synthesis-process was develped and applied from the RUHRCHEMIE AG. The hydrocarbon mixture produced was named "Kogasin". This process was used as an alternative to the so-called coal liquefaction, the high pressure hydro-genation process according to Bergius-Pier, in Germany in the WW2: Details of a special high-pressure hydrogenation process carried out at industrial scale in a plant where the author worked during the Second World War are found (12i) and in Plate 3 of PROJECT III (12d). Other methods for recovering methanol from methane [or from CO2] were addressed in the above-mentioned 20h-lecture. 1) Oxydation of methane with H2SO4/SO3 in the presence of Pd/Pt complexes: mecanism via CH3OSO3H, hydrolized. transferred to new compounds; equipment: autoclav. CO2 to remove without problem, non toxic (important for application in food industry). 5) Methanol from microalgae: Process studied by the National Renewable Energy Lab (NREL) USA. H2-savings; according to eq 6) 3H2 consumed. But these must also be viewed just as critically as the following processes when taking the profitability and the implementation at an industrial scale into account. The process “alcohols as fuel from sugar cane” belongs to the general subject “fuels from biomass (resp. biogas)”. biocrude: Fast pyrolysis to yield oxygenated hydrocarbon gas, rapidly quenched to avoid their decomposition by cracking, resulting in oily “biocrude” which has a wide range of applications – directly as fuel oil or altering its chemical composition; details about this subject regarding several countries in ref (18a-f). The process “methanol from the microalgae biomass” is studied by the National Renewable Energy Lab (NREL), USA (18g). In Brazil, during the ethanol manufacture from sugar cane they received a waste liquid called vinasse as co-product; to treat the latter anaerobic digesters are used (12k) – a process which gained popularity during the last 10 years. During his activities in Brazil (UFSM) the author spent much time in research to make use of vinasse (12k). The mentioned anaerobic methanogenic bacteria: “methanogenesis” have been used for the biogas generation in so-called “anaerobic digestion reactors”. Methanogene Organismen sind zum Beispiel: Methanococcus jannaschii, Methanothermus fervidus, Methanosarcina barkeri. In Brazil, compressed methane obtained from biogas is used as fuel in light- and heavy-duty vehicles. * Co-factors: MF = methanofurane; MP = methanopterine; CoB = Co-enzyme B; CoF = Co-enzyme F420 . In 1964, the author started his above mentioned co-operation with the Brasilian University USM (later UFSM) in Santa Maria, RS (12c), since 1973 as Professor honoris causa and full member of the UFSM. - halophytic plants like Crambe maritima (sea-kale/Meerkohl), to grow up plants which can be developed well also in salty water. In many countries fresh water threats to be in short supply in future. Regarding the world‘s water resources the relation of fresh water to salt water is 2 : 98. Plants tolerant of salt have to be cultivated in large scale. The author started together with Professor Dr.R.Wasicky senior and Dr.Tom Tafel already in the 70ies experiments in this line: unpublished results. Some details in refs (12n and 2o). on 26 January 2009 in Bonn, Germany. “We are laying the foundation today” – please download the statement of Federal Minister Sigmar Gabriel, Germany here. 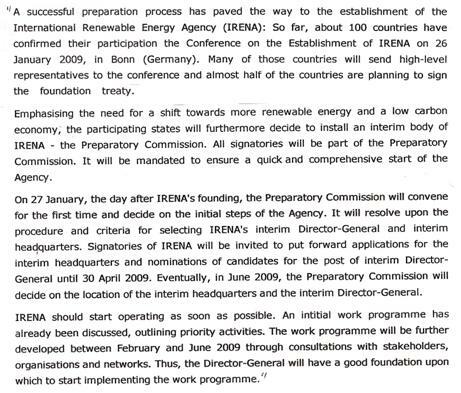 Remark: The foundation of IRENA comes with 36 years delay. The oil crisis of 1973 went unnoticed and would already have been the right moment. The author is “promoting” the utilisation of the inexhaustible “Power Station Earth” (12p) since the end of the 40ies of last century. But still: better late than never! The topic "non-peaceful use of nuclear energy" was only addressed in passing in the essay “Alternatives Energy Sources“. The way things are, the long standing demand to "abolish all nuclear weapons" will be just as unrealisable as the desire for an immediate shut-down of nuclear power plants of the second and third generation. Regarding nuclear weapons, it is a fact that there are countries that neither can nor will do without them: protection and/or prestige. It will take a long time until all current nuclear power plants have been replaced by others running on the "ball-type bed" basis, if at all. The wish to forswear nuclear weapons for good belongs in the realm of utopia for the time being, just as it is still in the lap of the gods whether energy by nuclear fusion has a future. FU Berlin, and UFSM, S.Maria (1960-1987). Meanwhile, clathrates containing O2 have become known. - In this connection, it is also worth mentioning that H2-clathrate hydrates (hydrogen clathrate hydrates) exist which may be regarded as hydrogen deposits. Klower Academic Publisher, Dordrecht, The Netherlands 2003, 278. Simultaneuosly the author had sent a report and copies of his CO2-experiments to Prof.G.Rienäcker, Institute of Inorganic Chemistry, University Rostock (12h). 3 lab reports 1987, 19 p (proposed to HOECHST and secreted). (SiH2)x is a solid powder, O2-sensitive, to be stored under N2 ; from 70° C on self-igniting, under N2 at 275° C decomposition into H2 + SiO2 (not melting), in dil NaOH delivering H2 + SiO2 , that means (SiH2)x promises to become an interesting “Hydrogen-carrier” : SiO2 SiCl4 + H2 (SiCl2)x (SiH2)x . Si itself can also serve as an “Hydrogen-carrier” [Si + H2O + 2NaOH 2H2 + Na2SiO3], but less effective than (SiH2)x , from Labs of BRASTONE and CONCULTING DEVELOPMENT ENGINEERING, Curitiba and S.Paulo, and from the Central Inst of Chemistry, UFSM, S.Maria, Brazil; cf. (12f). Lecture given in HOECHST 1952. Angew.Chemie B 19, 92-93 (1947) - with comments on pitch high-pressure hydrogenation plant; cf also Plate 3 in PROJ III (12d). In April 1970 the author gave the lecture entitled “Vinasse” in Santa Maria (UFSM), reporting about his first experiments carried out in Berlin to find applications for the by-product of the alcohol production from sugar cane (PETROBRAS). The later received vinasse results remained unpublished; cf also Plate 4. Experiments started in 1962 and were continued until 1978 on the grounds of the Institute of Biochemistry of the Berlin Free University in Lichterfelde-Süd, Ostpreussendamm 111. Experiments from 1974 until 1989 conducted at the FAZENDA of Professor Dr. Jose Mariano da Rocha Filho, Rio Grande do Sul, Brazil. b) what can be done to increase the tolerance of crop plants to salty soil. Our comprehensive experiments had to be restricted to 14 crop plants, however. The results obtained over 24 years are meagre: Unfortunately, only two crop plants turned out to be especially useful: sea-kale (Crambe brassicaceae) and a rare broccoli species. We did not succeed to let grow wheat, rye and potatoes on salty soils that permit to grow sea-kale. In the opinion of the author, this is a pressing problem: The supplies of fresh water are shrinking, and the world population increases rapidly. Also see ADDENDUM II to Plate 6.
in "Berliner Zeitung" No. 255 of October 30, 2008. Topic: Where to dispose nuclear waste? "When the grand coalition started out three years ago, it intended to tackle one of the most tricky projects of all. After decades of standstill, heated disputes in court and unparalleled protest marches in the streets, it decided to start looking for a repository for radioactive nuclear waste. If at all, politicians thought at the time, only a coalition of the two major political parties SPD and CDU/CSU will be able to solve this ongoing conflict loaded with so many emotions. For who wants waste radiating for millions of years near their house? Yesterday, the Government had to admit a de facto failure, even though both the conservatives and the socialists agree despite differing opinions regarding the future use of nuclear energy that Germany does need a repository. The present state where a major part of the nuclear waste is stored in temporary sheds near the power plants is untenable in the long run. Instead of searching for the best possible location with an open mind, however, the coalition got side-tracked by an embarrassing dispute about government interests." at the National Renewable Energy Laboratory’s (NREL), 21st industry Growth Conference, Oct 28-30, 2008 in Denver, CO.
approximately 1,5 m wide. Out of sight and safe from nefarious threats, buried underground and guarded by a security detail. It is impossible for the module to go supercritical, “melt down”. Like a power battery (factory sealed, never to be opened on site).The waste produced after five years of operation is approximately the size of a softball and is a good candidate for fuel recycling. HPG produces 25 WMe – enough to provide electricity for about 20.000 average American sized homes or its industrial equivalent. Price: 25 million dollar. Man benutzt die Mobilität des Wasserstoffs. Der Wasserstoff bremst die Neutronen ab, die beim Zerfall des Urans entstehen, so dass sie weitere Atomkerne spalten können und die Kettenreaktion in Gang bringen. Wird der Brennstoff zu heiss, löst sich der Wasserstoff vom Uran und die Kettenreaktion wird schwächer. Ist das Uran weit genug abgekühlt, läuft sie wieder an. Die Uranhydrid-Technik ist nicht neu, sie basiert auf Reaktoren für Atom-U-Boote. Einwände gegen solche Mini-Kraftwerke: Der Wasserstoff muss immer wieder gereinigt, das Gasvolumen gemessen und angepasst werden (Wartung). Der Wasserstoff kann zu Explosionen führen. Das Kühlmittel Kalium ist leicht entflammbar (flüssiges Kalium hat hohen Dampfdruck, so dass es sich allein durch die Kühlrohre bewegt, Pumpe gespart). (18c) Mitsubishi Heavy Industries, Ltd.
private information by Dr.D.Kirstein, Köln. Dr. Pesserl had considerable experience with cattle: In Brazil and Argentina, he had the nickname "Dr. Lukewarm", because he had pointed out to ranchers in Argentina that lukewarm water is better for cows than cold fresh one. He had observed that thirsty cattle faced with the choice between stale brackish water and fresh water preferred the former, because it agreed with them better.